Today, I'm bringing you some of our favorite weeknight recipes that are quick and easy to throw together. I aim for 45 mins or less, with ingredients that are easy to keep on hand or to grab from the grocery store without having to endlessly walk the aisles for crystallized ginger or west African spice rub. Hope some of these are hits for you guys, and I'd love to hear any other favorites you may have! 1. 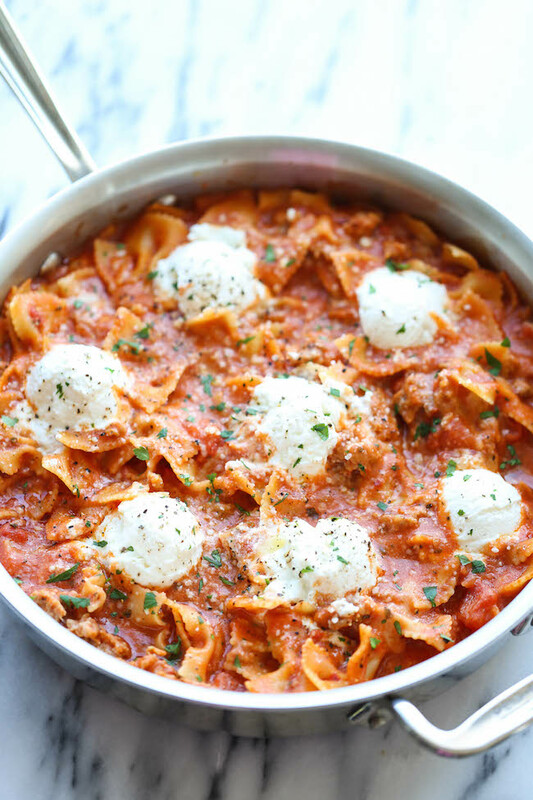 One pot lasagna. This is sooooooo good, and best of all is that everybody eats it. I love it with the Italian sausage, but substituting ground beef is even quicker. The recipe I use is here. 2. 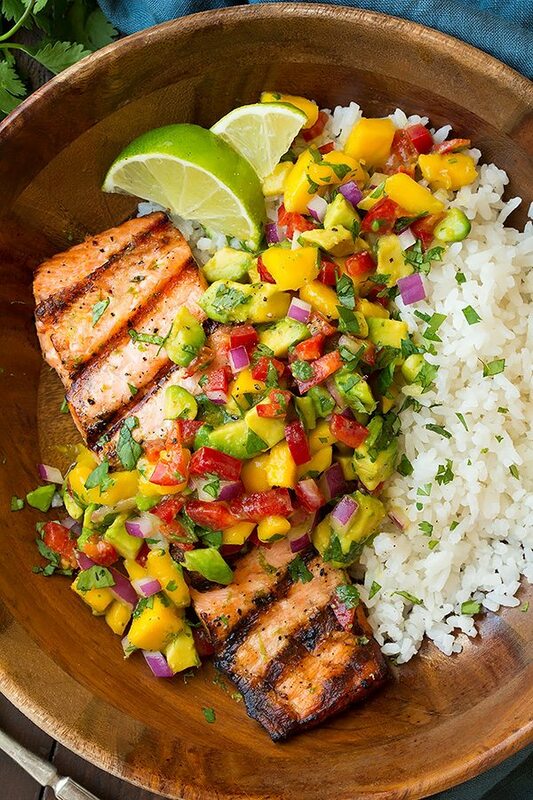 This Grilled Lime Salmon with Avocado-Mango Salsa may be the best thing I’ve ever eaten. This recipe takes closer to 45 mins to an hour because of all of the chopping, but I’ve also thrown all ingredients (onion, bell pepper, mango and cilantro) into a food processor on chop to cut down time slicing and dicing by hand. Except for the avocado. I cut that up myself. I’m excited to start grilling the salmon on the grill now that it’s FINALLY SPRING, but if you go the oven route it takes about 40 mins at 350 degrees. Recipe here. 3. One pot chicken curry and vegetables. This one I found on Instagram (thanks to @jennaskitchen!) quite a while back and it’s become one of our most cooked and very favorite dinners. Warm 1T of avocado or olive oil. Season 3 chicken breasts (butterfly these if they’re tick) with curry powder, dried parsley, salt, and pepper. Sear chicken for 3 minutes on one side and then flip over. Toss in veggies (we like to use thinly sliced purple potatoes, carrots, and mushrooms) also seasoned in curry powder, salt, and pepper. Pour in 1 cup coconut milk and bring to a boil, then cover and turn down low to simmer until the veggies are soft and the chicken is cooked through. Serve over rice. 4. 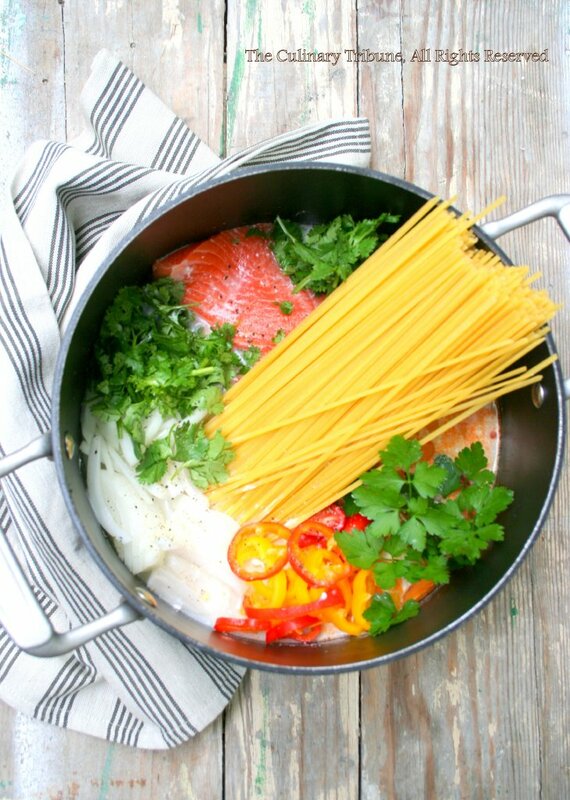 One pot Salmon and Curry pasta. Can you tell we love curry? And salmon? This one is so easy because you toss all ingredients into a stock pot, cover, and go. Recipe here. 5. Home made pizzas. We love getting pizza dough from Trader Joe’s or Giant Eagle and having Oskar and August add sauce, cheese, and toppings. Typically the boys only want mozzarella on theirs, but I have them add prosciutto, mushrooms, and artichokes to ours. Bonus for keeping the kids busy for a little while, and a double bonus because they’re much more likely to eat what they cook themselves. We also like to pair our pizza with a salad kit on the side (the kale salads from Giant Eagle are so good!) Easy peasy, and everybody loves them!